These cutterheads replace the standard straight-knife cutterheads on our Grizzly jointers and planers. 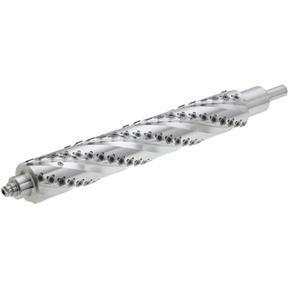 Each cutterhead has four spirals with indexable, four-sided carbide inserts that can be rotated four times for a new factory-sharp edge. The 6" and 8" Jointer cutterheads include cast iron pulleys, bearing blocks and mounting studs. All cutterheads include 5 extra inserts, T-handle wrench, Torx® bits and spare insert screws. These Grizzly cutterheads leave an incredible finish and are comparable to the Byrd® cutterheads in quality of cut as well as the quality of the cutterhead itself. Also the oil fill is stupid. I changed it and now have a sight level gage. I need to machine the end plate so the seal is on the outside. It's leaking. I also made (2) other changes. I will call and explain them. Or call 508/867-6546 John A. Lapierre Thank You. I installed this cutter head into my old Grizzly G1033 20" 3 hp planer. If you have any mechanical ability at all, you will find this a fairly easy swap. I would recommend purchasing new bearings (much easier than swapping out the old ones). Another set of hands was helpful as well. The cutter head gives a very nice finish. I'm extremely impressed! First thing I noticed was how much quieter the machine runs (empty and planning). Another consideration is horsepower. These cutter heads take a little more power to operate. I found that 3 hp would no longer remove 1/8" of material in hardwoods (ran fine no complaints, by taking more passes and removing 1/16"). In my case I need to keep up production speeds, so we upgraded to a 5 hp motor. That put the planer back to working with 1/8" cuts no problem. Bought 20 inch sprial cutterhead on thursday and received it on monday. It came in damaged. I contacted Grizzly customer service on monday. They shipped the parts to fix it on tuesday. Great Service! Go454 20 inch planner works better than ever with the new cutterhead. wood comes out slick as a piece of glass. I am a satisfied customer with Grizzly Imports since 1987.